The Sol de la Mañana is a program designed and run by the Rodriguez family that is focused on trying to make the production model for small producers in Bolivia more sustainable. When we first started sourcing coffee from Bolivia in 2011, annual exports were around 70,000 bags (which, to put it in perspective, is equivalent to the annual output of one large farm in Brazil). Over the last few years this production has more than halved to a devastating 22,000 bags per annum in 2016. There are several factors contributing to this decline. One is that coffee competes with the local coca industry, and coca is easier to pick, harvests all year round and often yields higher profits for farmers. The coca plantations have a devastating impact on the land and the communities in the long term; untouched rainforest is often illegally destroyed to plant coca, and a lack of shade trees leads to huge problems with erosion. The excessive use of biocides by coca producers in an effort to bolster their crops also renders the soil infertile over time, and the land is then abandoned as nothing else can be grown there. The absence of a centralised body to support and promote coffee production has also threatened the vitality of coffee trade in Bolivia. Unlike other coffee-producing countries, such as Guatemala or Brazil, coffee producers in Bolivia receive no support from the government or national agricultural bodies. Historically, a lot of support was given to the Bolivian coffee industry by the US (trying to encourage the growth of alternative crops to coca) however President Evo Morales, (who himself is an ex- coca grower) stopped accepting all US aid two years ago. 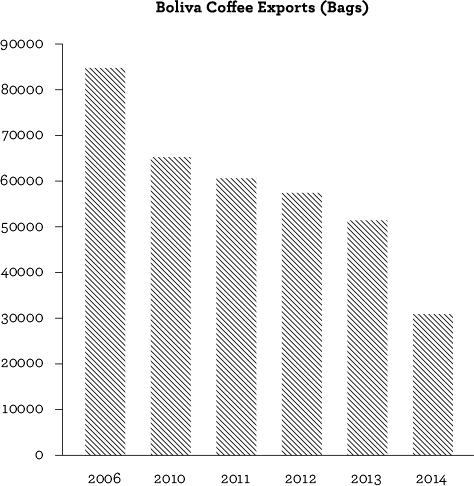 In Bolivia, there is very little support available for producers. Unlike Central America, there are no institutes, or organisations that support producers or provide information and education. These factors, coupled with poor infrastructure, changing climate conditions, roya (leaf rust), and traditional, sometimes unsophisticated farming practices have led to a significant decrease in production over the past decade. The good news is that there is hope for the future of coffee in Bolivia, thanks to the vision, determination and hard work of Pedro, Daniela and Pedro Pablo Rodriguez of Agricafe who have established the Sol de la Mañana program which is focused on trying to turn around this trend and build a sustainable future for coffee production in Bolivia. The program came about in 2012 after 15 local producers approached Pedro Pablo and asked for help. “It wasn’t an easy decision to set up the program. It took 4 months of discussions and planning. Over the previous 10 years we had tried other programs, providing some farms with financial support, or young coffee plants but these never worked out in the long-term”. Currently, the average production of a single producer is 2.5 bags of green coffee per hectare. Given the average producer has 1-3 hectares of land, this means they are only producing around 10 bags of coffee to survive. To have a sustainable production model, coffee farmers in Bolivia need to be producing 30 – 35 bags of coffee per hectare. The Rodriguez family decieded to set up a curriculum that would tackle this problem head on, focusing on giving producers the skills and training they need to increase the quantity and improve the quality of their output. Currently most coffee farms are what the Rodriguez family would classify as ‘silvestre’ or ‘wild’. Pedro Pablo remembers “it was common that the only time farmers entered the farm was for the harvest season. They didn’t understand that simply left alone, their plants would produce less or die”. The aim of the program is to educate the members of the program show them how to take a more systematic and scientific approach to coffee farming in order to help them increase their productivity. The program is set up like a course, starting from the basics. The curriculum focuses on one aspect of farming at a time, and cover things such as how to build a nursery, how and when to use fertiliser, how to prune, has how to selectively pick. “We require that the producers meet deadlines for each topic. Those who are unable to meet the deadlines are asked to rejoin the program the following year. We have been intentionally strict as we want the group to learn the right way and to succeed and see the results” explains Pedro Pablo. As the producers have become more productive, Agricafe has stressed to them that they should continue to focus on quality rather than quantity. “We have seen farms go out of business by expanding too quickly, doubling or tripling the size of their land, using all of their resources and not being able to control the farm. We are teaching the producers to look after what they have and make the most of it. Then, once they feel comfortable they can buy more land if they want”. An example of this comes from a producer who has been working in the region for 40 years. She now has 2 hectares of land and does not want anymore. She has realised that she can live off of the 2 hectares if she concentrates on quality procedures. She is teaching her sons the techniques she has learnt so that they can buy a farm themselves and start right. An issue that was identified via the program was that good quality fertilisers for nutrition were not readily accessible in the region. “We were teaching producers how and when to use fertilisers for nutrition but they would come back telling us that they didn’t work”. As it turned out the only locally available fertiliser was a non-certified poor quality one. “We took the decision to buy and bring it into the region ourselves and sell it to the producers and local farmers at a 50% discounted price. The fertiliser was expensive and many couldn’t afford it without the discount.” This important step required Agricafe to spend 4 months acquiring a licence to sell nutritional fertiliser, but Pedro Pablo says the results were worth it. Agricafe also hosts workshops with leading agronomists throughout the year. These forums allowed the producers to meet one another, share their experiences and discuss ways to tackle problems they are experiencing. Over time the producers have become more experienced and confident and actively sharing their learning with each other. 2017 was the first official year of production for producers of the Sol de la Mañana program and Agricafe could not be happier with the results. The quality is up, and producer yield has also doubled to around 20 bags a hectare. The program originally had 10 members (including the Mamani Family, who we have worked with for a very long time), and now the program has been extended to support a further 50 producers, with plans to extend the program to a further 50 producers in the Las Yungas region, which overall will represent around 100 – 200 hectares in the region. Already the impact has been profound, and way beyond the Rodriguez family’s expectations. The key to its success, according to Daniela is that the producers feel empowered. The Sol de la Mañana program has required a huge investment of capital, time and resources from the Rodriguez family. But they genuinely believe in Bolivian coffee and care deeply about helping the producers they work with realise their potential and improve their lives. And we are right there with them. The coffee in Bolivia is way too special, spectacular and close to our hearts to let it disappear. We want to be able to buy from the same producers every year, for many years to come. In the short term, this means paying higher prices to make it viable for our favourite producers to stay in coffee, as the building blocks are put in place to help them increase their yields and annual production. By demonstrating this commitment, we hope they will continue to investing coffee production and maintain their focus on quality, and that, with time, a more sustainable and vibrant future is built for coffee in Bolivia.